Greg Scheer has provided a comprehensive resource for any musician or pastor who leads worship services. THE ART OF WORSHIP gives in-depth instruction on assembling the right team, choosing the music, conducting rehearsals, and much more! About "The Art of Worship"
Contemporary worship continues to gain strength as the form of worship of choice for many churches across the country. 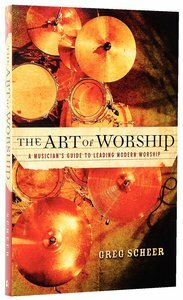 The Art of Worship is a complete resource to which a musician or pastor can turn when asked to lead contemporary music. It provides in-depth instruction to every aspect of contemporary worship leadership--from assembling the team to choosing the music to conducting rehearsals. Author Greg Scheer takes a balanced, holistic approach, embracing the contemporary style without denying older traditions and encouraging excellence without ignoring the realities of the local church context. Worship team leaders, musicians, and pastors looking for a quality, comprehensive resource need look no further. Your complete leadership resource for contemporary worship Is your church launching a contemporary service, trying to balance traditional and modern musical tastes, or seeking relevant worship for a secularized society? If so, here is the complete guide to making it happen. From enlisting and training an effective leadership crew to overcoming opposition from resistant church members, The Art of Worship charts a clear course through every aspect of worship. Comprehensive technical details, biblical principles, and action steps make this an invaluable resource for musicians, leaders, pastors, and students reaching for new horizons in ministry. ? 'The Art of Worship is a very practical tool. It will enable the worship leader or worship committee to thoughtfully analyze their current style of worship and to plan step by step for future change. - - - Robert E. Webber, Northern Seminary, author of Ancient-Future Faith ? 'This comprehensive guide to the nuts and bolts of contemporary worship leadership will challenge both new and veteran leaders to rethink their approach to a host of practical challenges. Greg Scheer demonstrates that we never have to choose between integrity and relevance in preparing to lead God - 's people in worship. - - - John D. Witvliet, author of Worship Seeking Understanding ? 'This book should be read by those on the inside of - ?contemporary - ? worship leadership who do not yet understand the full breadth and depth of church music ministry and by those on the outside who do not yet believe that - ?contemporary - ? worship is capable of the full breadth and depth of church music ministry. - - 'Terry W. York, School of Music and Truett Seminary, Baylor University ? 'TheArt of Worship provides great illustrations, solid theology of worship, and is not just for musicians; pastors will also benefit from learning about the dynamics of building teams that lead music in worship. - - - Emily R. Brink, senior research fellow, Calvin Institute of Christian Worship Greg Scheer is a composer, a church musician, and a choir and music director who has served in several churches. He is currently minister of worship at Church of the Servant and a music associate with the Calvin Institute of Christian Worship, both in Grand Rapids, Michigan.